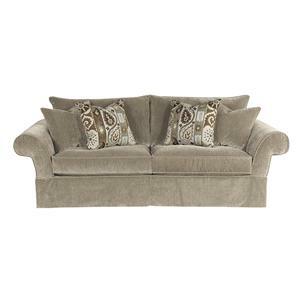 This classic sofa is a subtly elegant piece that will never go out of style. Featuring traditional design accents like rolled arms, upholstered skirt, and welt cord trim, this piece has a sophisticated look that doesn't distract away from the central role that comfort plays in modern life. Constructed with a deep seat, this sofa will hug your whole body with the plush and resilient feel of featherblend cushions. Accent your living room with the bold pattern of the stylish Accent Chair. The Chair features a large seat cushion with welt cording, a tight seat back with an oversized throw pillow for extra cushion. The arms are thick padded roll arms with the back mimicking them with another large roll. The Chair sits on turned legs completing the traditional look. The bold pattern blends beautifully with the neutral tones creating a sense of calm without compromising style. 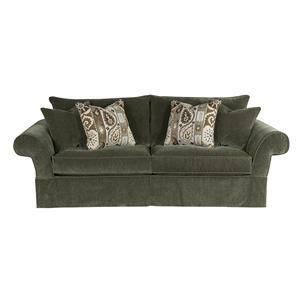 This casual loveseat will make a great addition to your living room or den. 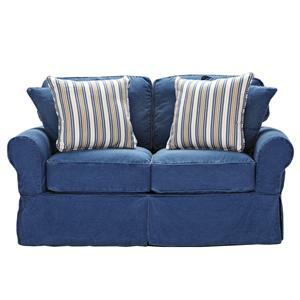 The casual styling is made ultra comfortable with plush seat and back cushions, plus four loose accent pillows. Choose from either blue denim or natural denim to bring this laid-back style into your home. 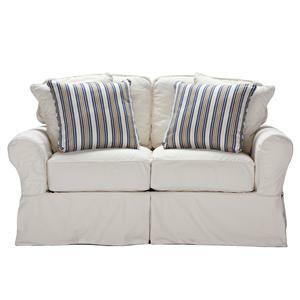 Simple rolled arms and a kick pleat skirt are trimmed with welt cord trim, as are the reversible seat cushions and T-shaped loose back pillows. 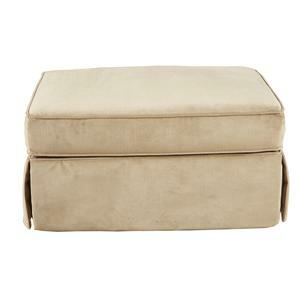 Kick back with your feet up on this contemporary ottoman. A versatile accessory for any lounge area, this piece features a boxed seat cushion lined in weltcord trim and raised by tapered wood legs. Its 1.8 density foam core makes for a soft and supportive seat, footrest, or even table in the center of a room. 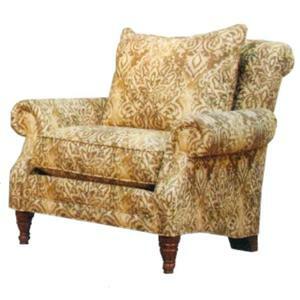 Pair with its matching chair for head-to-toe comfort and coordinating style. With traditional style, the sofa is sure to make a statement in any living room. The sofa has texture and pattern with elegant style. The Sofa will catch your eye with the use of different prints on the seat cushions and pillows. 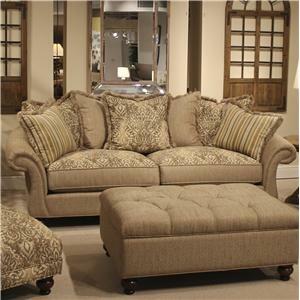 Features include flared roll arms, tall bun feet, welt cording and a variety of throw pillows. Each pillow has a different print and is framed with fringe keeping everything cohesive. Invite your friends and family over to share in the beauty and comfort of the Sofa. 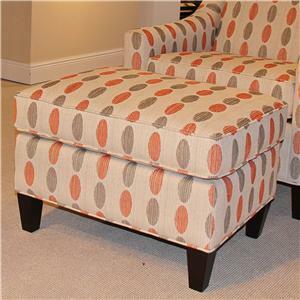 This skirted ottoman offers relaxing comfort and luxurious elegance for any room. Pair with the coordinating chair or loveseat to use a relaxing footrest, or place next to a sofa or chair to use as a soft ottoman. The rectangular seat cushion is encased in welt cord trim, and the base is covered in a kick pleat skirt to match those of the coordinating chair, loveseat and sofa. With a stylish sophistication that centers on contemporary design and smooth draped upholstery, this comfortable chaise will bring living rooms an element of luxury and elegance that allows homeowners and guests to spread out in comfort with an extended seat depth. 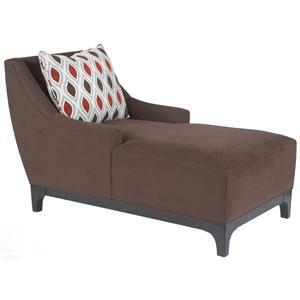 Framed with low track arms and an exposed wood base, this chaise will supply a chic design style in an up-to-date fashion that includes a single accent back pillow for complementary comfort.